Home » Design » Window decor, curtain. Reign of Louis XVI 18th century. Window Decor, curtain. Reign of Louis XVI (gilded wood). 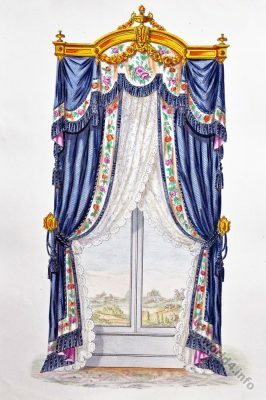 Window Decor, curtain (gilded wood). Reign of Louis XVI 18th century. Baroque, Rococo era ca. 1780. Associated to: Fashion in the reign of Louis XVI. 1774 to 1780. From the book: Le Magasin de Meubles by Victor Quetin. Album complet & Reference de tous Meubles qui se fabriquent a Paris contenant environ 300 modeles, dessines en perspective. Previous PostDesign for Living room.